Across the road from my cabin was a huge clear-cut—hundreds of acres of massive spruce stumps interspersed with tiny Douglas firs—products of what they call “Reforestation,” which I guess makes the spindly firs en masse a “Reforest,” which makes an individual spindly fir a “Refir,” which means you could say that Weyerhauser, who owns the joint, has Refir Madness, since they think that sawing down 200-foot-tall spruces and replacing them with puling 2-foot Refirs is no different from farming beans or corn or alfalfa. They even call the towering spires they wipe from the Earth's face forever a “crop”--as if they'd planted the virgin forest! But I'm just a fisherman and may be missing some deeper significance in their nomenclature and stranger treatment of primordial trees. In David James Duncan, The River Why (1983), 71. As the human fetus develops, its changing form seems to retrace the whole of human evolution from the time we were cosmic dust to the time we were single-celled organisms in the primordial sea to the time we were four-legged, land-dwelling reptiles and beyond, to our current status as large­brained, bipedal mammals. Thus, humans seem to be the sum total of experience since the beginning of the cosmos. From interview with James Reston, Jr., in Pamela Weintraub (ed. ), The Omni Interviews (1984), 99. Previously published in magazine, Omni (May 1982). High technology has done us one great service: It has retaught us the delight of performing simple and primordial tasks—chopping wood, building a fire, drawing water from a spring. In 'Science and Technology', A Voice Crying in the Wilderness (Vox Clamantis in Deserto) (1989), 91. Let him [the author] be permitted also in all humility to add … that in consequence of the large arrears of algebraical and arithmetical speculations waiting in his mind their turn to be called into outward existence, he is driven to the alternative of leaving the fruits of his meditations to perish (as has been the fate of too many foregone theories, the still-born progeny of his brain, now forever resolved back again into the primordial matter of thought), or venturing to produce from time to time such imperfect sketches as the present, calculated to evoke the mental co-operation of his readers, in whom the algebraical instinct has been to some extent developed, rather than to satisfy the strict demands of rigorously systematic exposition. In Philosophic Magazine (1863), 460. 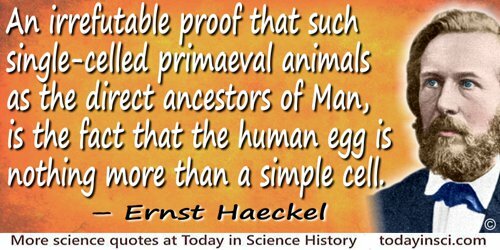 Man … begins life as an ambiguous speck of matter which can in no way be distinguished from the original form of the lowest animal or plant. He next becomes a cell; his life is precisely that of the animalcule. Cells cluster round this primordial cell, and the man is so far advanced that he might be mistaken for an undeveloped oyster; he grows still more, and it is clear that he might even be a fish; he then passes into a stage which is common to all quadrupeds, and next assumes a form which can only belong to quadrupeds of the higher type. At last the hour of birth approaches; coiled within the dark womb he sits, the image of an ape; a caricature of the man that is to be. He is born, and for some time he walks only on all fours; he utters only inarticulate sounds; and even in his boyhood his fondness for climbing trees would seem to be a relic of the old arboreal life. In The Martyrdom of Man (1876), 393. Thales thought that water was the primordial substance of all things. Heraclitus of Ephesus… thought that it was fire. Democritus and his follower Epicurus thought that it was the atoms, termed by our writers “bodies that cannot be cut up” or, by some “indivisibles.” The school of the Pythagoreans added air and the earthy to the water and fire. Hence, although Democritus did not in a strict sense name them, but spoke only of indivisible bodies, yet he seems to have meant these same elements, because when taken by themselves they cannot be harmed, nor are they susceptible of dissolution, nor can they be cut up into parts, but throughout time eternal they forever retain an infinite solidity. In De Architectura, Book 2, Chap 2, Sec. 1. As translated in Morris Hicky Morgan (trans. ), Vitruvius: The Ten Books on Architecture (1914), 42. Translated from his Ueber die Entstehung und den Stammbaum des Menschengeschlechts, (1873), Vol. 2, as an epigraph to Chap. 6, The Evolution of Man, (1879), Vol 1, 120-121. The man who speaks with primordial images speaks with a thousand tongues. The mind, in short, works on the data it receives very much as a sculptor works on his block of stone. In a sense the statue stood there from eternity. But there were a thousand different ones beside it, and the sculptor alone is to thank for having extricated this one from the rest. Just so with the world of each of us, howsoever different our several views of it may be, all lay embedded in the primordial chaos of sensations, which gave the mere matter to the thought of all of us indifferently. In 'The Stream of Thought', The Principles of Psychology (1890), Vol. 1, 288.